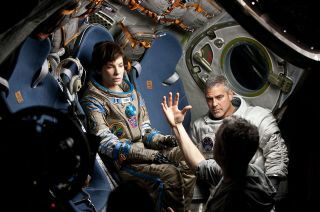 Sandra Bullock, George Clooney and director Alfonso Cuarón on the set of the dramatic thriller "Gravity." In the new movie "Gravity," starring Sandra Bullock and George Clooney, it's possible to forget you are watching a film and not NASA footage. A scene from Warner Bros Pictures' "Gravity" showing the space shuttle Explorer and the Hubble telescope. Click through to collectSPACE.com to watch an exclusive interview with “Gravity” star Sandra Bullock and director Alfonso Cuarón. Follow collectSPACE.com on Facebook and on Twitter at @collectSPACE. Copyright 2013 collectSPACE.com. All rights reserved. Follow SPACE.com @Spacedotcom, Facebook and Google+.